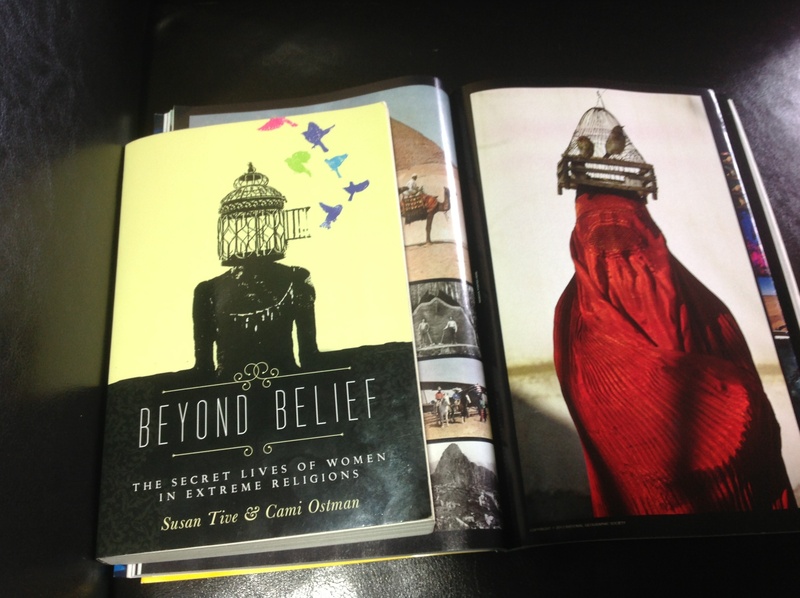 “What?” he asked as he leaned over my shoulder to look at the images of our book cover and the National Geographic picture of a woman in a burqa with caged birds on her head. He hadn’t even noticed the uncanny similarity! The placement of the two pictures side by side was a complete coincidence. As you might imagine, I sat for a good long time studying the similarities and the differences here. I posted the picture on Facebook immediately and sent a note to the designer (who also happens to be a contributor to the book). I wanted everyone else to be as taken with the coincidence as I was. What strikes me are the birds. In one image they fly free; in the other, they live in a very, very small space. There was a time in my life when I lived in a small space, too—when I looked at the world through the mesh of a limited theology and worldview. In truth, I (like everyone else, I assume) still have plenty of self-limiting beliefs that sometimes make me feel like I don’t have enough room to spread my wings. As Susan and I are fond of saying, “You can take the girl out of the religion, but you can’t take the religion out of the girl.” The “total depravity” doctrine still haunts me at times, even though I’ve consciously given it up. But seeing our book cover sitting beside the image of this covered woman with the birds on her head made me remember how much range of movement I actually do have. For me and for most Western women I know, the limitations we have live mostly IN our heads, rather than being forced burdens placed ON our heads. I don’t know the life story of the woman in the National Geographic picture above, of course, but I do know there are plenty of girls and women who don’t have the option of choosing their lots in life (whether they cover their bodies or not). Today I will be thankful to be an uncaged bird, and I will ponder how I can support those who are not so free. Note: I hope in addition to reading Beyond Belief, you’ve all read Half the Sky by Kristof and WuDunn. Yesterday I attended the funeral of the mother of a friend. The service was a beautiful tribute to a woman who was committed to her family and community and who made an impact on everyone she met. Though I didn’t know her personally, I was touched by the obvious love and affection everyone in the audience felt for her. I wish I’d had the chance to get to know her, and I’m grateful to know her daughter. During the service, there was a lot of talk of heaven. I could see that the hope of eternal paradise brought great peace to the grieving family–and a much needed promise of seeing their beloved again that allowed for a celebration in the midst of their deep sadness. I do not begrudge anyone this faith in the afterlife. In fact, I well understand it and have respect for those who live their lives today for the reward they will receive in the hereafter. Most of my friends who believe in heaven are people who bring consciousness and intention to their lives. The ceremony invited me to reflect on my own history. I once (for about twenty years) filtered all of my decisions through a narrow focus on the afterlife. For me (and I’m only talking about myself here) such a focus was very stressful. I never felt the comfort others talked about when discussing heaven. Instead, I worried about the eternal to the detriment of the “now.” I feared making mistakes–particularly in my dogma–because everything I did or thought or believed was so dire in my mind. The years I was involved in a literalistic way of understanding God were years spent being very serious, and very frightened of failure. I was particularly terrified of failing to tell others about my faith because I believed that those who didn’t share my doctrine, would go to hell. The idea of hell and of anyone going there being intolerable to me, I think I must have been terribly tedious to unbelieving friends as I insisted they convert to my way of thinking. Not all people of faith who look forward to heaven are primarily trying to avoid going to hell, but I was. In the years since I realized I needed to unpack my doctrines and loosen up my literalistic thinking, I’ve come to understand that we all make sense of death in unique ways. We have to. Death is always with us as one of the surest things in the human experience. As I sat in the memorial service yesterday and watched the slide show of my friend’s mother roll out the chronology of her life, I realized that she’d brought “heaven” into the lives of those she loved as surely as they hoped for heaven for her now. Because I sit much more in a place of not knowing (and not needing to know what I don’t know) than I used to, I was able to stay in the moment with those gathered, to tippy toe between the grief and the joy palpable in the auditorium, and to feel happy for the hope of reunion the family held. This is progress for me, and I’m glad for it. In my religious days, I was activated by fear when I was with those who believed differently than I did. And then for many years after my “shift,” I was activated by anxiety when I encountered anyone speaking my old language of eternity. My heart was happy yesterday that I was able to enter into the essence of the memorial without any inner gnashing of teeth. It felt like heaven. My questions for you: What still hooks you? What have you made peace with?